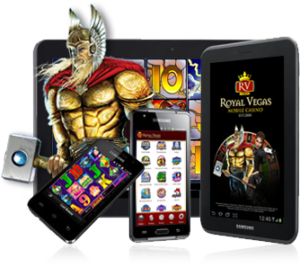 Royal Vegas This Week: The hottest online slots by actual RTP. You may remember a few weeks back, we had a debate over whether cold or hot slots are the best online slot machines. The hot ones are dishing up the highest payouts at the moment, so they might be best. Or, perhaps the cold ones, which haven’t paid in awhile, are due to deliver? In the end, it’s the player’s decision to make. Either way, that principle got a strong reaction from you – our readers. So we’ll take a look at this week’s luckiest mobile slots at Royal Vegas. In accordance with variable personal preferences, we’ll cover both ends of the spectrum – hot and cold. There are two distinctly hot and cold slot at Royal Vegas right now. They are both Microgaming creations that date back a few years. These games currently exhibit the highest and lowest return to player (RTP) of all slot machines on the Royal Vegas platform. We’ll start with hot (highest RTP) and then move on to the cold (lowest RTP). Galacticons is a 5 reel, 243 ways to win slot machine with an animated aliens theme. Not very imaginative, I know. The graphics and sound effects aren’t all that interesting either, but it’s got some good features. It also has a lot of payout potential lately. At time of writing, Galacticons is recording an impressive 368.12% RTP. The game’s symbols are mostly colorful alien creatures and playing card values. The blue Milky Way symbol is the Wild, and substitutes for other icons while doubling all payouts it’s involved in. The Sun is the scatter, delivering scatters pays of up to 100x the triggering bet when 5 appear. It will also activate free games for landing 3 or more on the screen. If Galacticons keeps paying at the rate that it is now, this lucky mobile slots is a fiery hot winner. Crocodopolis was released in 2015 with 5 reels and 25 paylines. It has a rather silly theme, where crocodiles take over Egypt. More cartoon style graphics here, combined with music that can get annoying over time. But again, there are some decent features to look forward to. The Croc is wild, and performs different tasks depending where he lands. On reel 1, he’ll double any prize he’s involved in. On reel 2 or 4, he triples his combo prizes. On reel 3, he expands to cover the full reel. On reel 5, he expands on the reel, and pays triple prizes he’s combined in. The Pyramid is the scatter, appearing only on reels 2, 3 and 4. Land three of them to trigger 12 free spins with a 2x multiplier. The Croc wild has the same function during free games, with his multiplier added to the static 2x free-games multiplier. Scatter pays of 2x and 5x the triggering bet are paid for 2 or 3 scatters respectively.